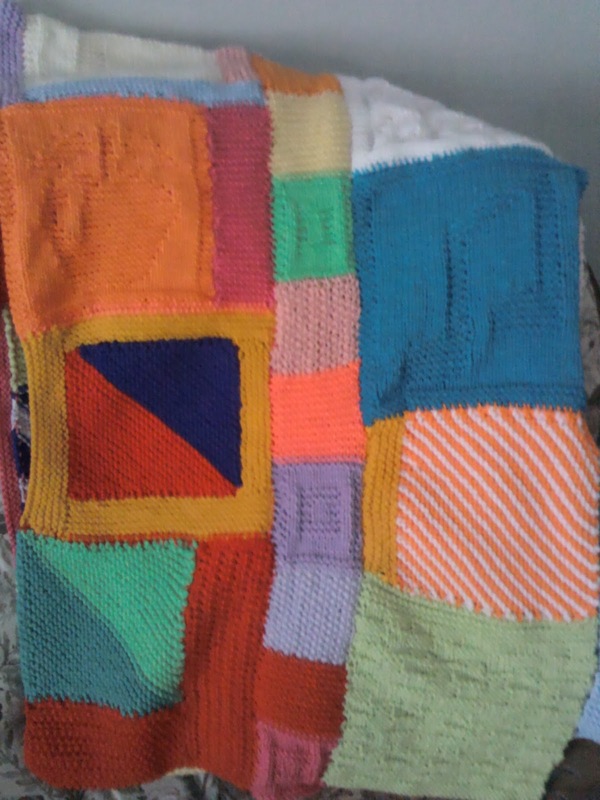 I love making blankets and joined a knitted square swap. 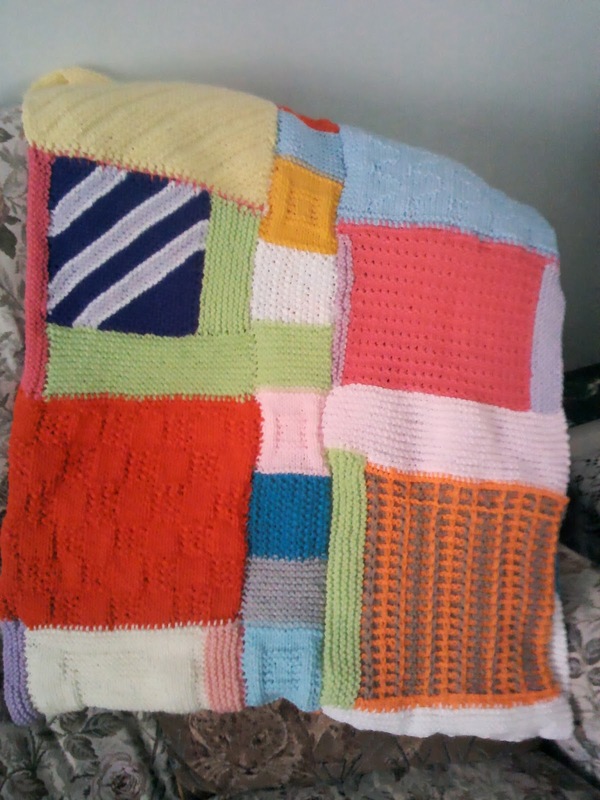 We knitted squares that were 8inch x 8inch and had a different partner each month to send them to. We knitted two squares one for your partner and one for yourself, then when you have enough squares your sew them together. People from all over the world were joining in from Europe, Australia, America and in the United Kingdom. Postage cost was getting expensive though and I gave up as I could not afford to keep sending them. I got some lovely knitted squares and loved them all the only problem was I got 6 inches square, 7inches square, 7 x8 inch, 8 inches square, 8x9 inches and some almost 10inches square. I had started to sort out the various sizes and thought I would make several blankets and simply knit squares to add to those I had already. So I gathered together my squares and started to add on so they were the same size. Picking up stitches and doing a simple garter stitch worked well. I used various colours rather than trying to match the colour of the square I was adding on to. This made them all different and gives the blanket a real patchwork effect. I used a Baseball stitch to join the squares together and Mattress stitch for joining the long strips, both are shown in the link above How to join Modular squares. The first strip looked great but then I started on the second strip and offered it up to the first, I did not like the effect at all. So now I had a new problem how to make them look effective. Then it struck me make a strip with smaller squares then add the strip with the larger squares. This is the blanket folded in half, well to be accurate it is only part of the blanket as it will eventually fit a double bed. This is the other side of the blanket if you know what I mean. I will work on making the small square strip next and add this to the right hand side and then add the larger squares again. In November we have a new theme in the Knit it up team on Spark people. Holiday Stash Busting so I will continue with the blanket and knit squares that have Halloween and Thanksgiving and maybe Christmas themes to add to the mix. I have found various dishcloth patterns that I can use and it does not matter if they are odd sizes as I can add on to make them fit. So lots of stash will be used up and the end result should be a very bright and colourful blanket that is totally unique. I will add a border to it as well may be a knitted border or I may go with a crochet one it will depend on what I think will look best in the end. So from a lot of odd sized squares I will have a Patchwork blanket from friends around the globe as well as lots of squares that I have made as well.